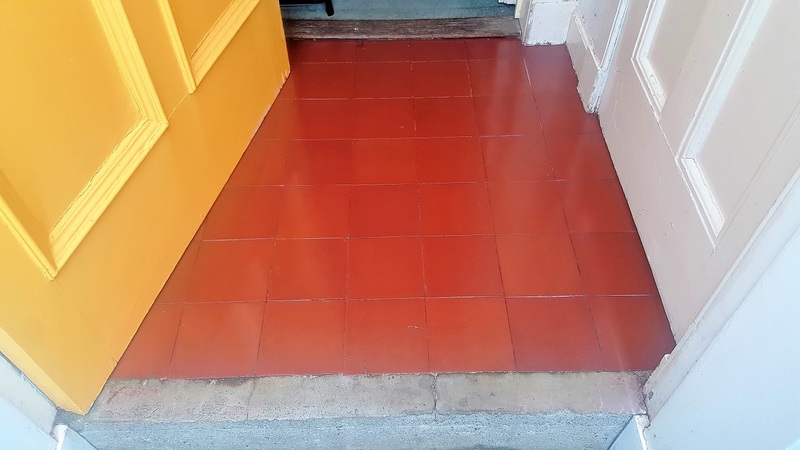 The restoration of this old Quarry tiled porch floor was carried out at a house in the west end of Edinburgh famous for its historic buildings and cobbled streets. The tiles were very old (possibly Victorian) and a number had patterns painted on with a stencil at some time in the past and these had now worn away leaving mainly white paint, I’m sure the patterns looked great initially but years of wear and tear had certainly taken their toll on them. First the floor was covered with a Tile Doctor Oxy-Gel which is a new product based on the popular Pro-Clean product but in a more manageable gel form. We left the Oxy-Gel to soak into the pores of the tile for ten to fifteen minutes, we were working in a tight space so the gel ensured the product remained in position. The tiles were then scrubbed by hand and then rinsed which removed most of the hard ground in dirt. 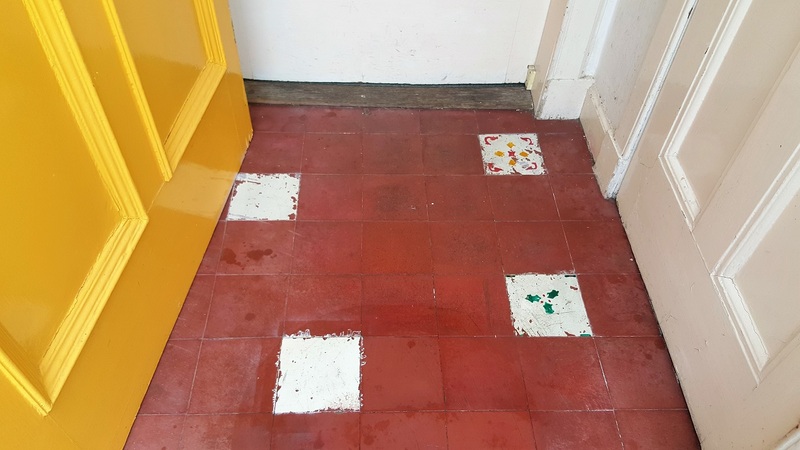 To remove what was left of the paint stencils the tiles were individually treated with Tile Doctor Remove and go which is a powerful coatings remover, its was worked into the tile as before and the paint came away. Last step before sealing was to give the floor a final clean with another solution of Oxy-Gel and then rinsed with neutral tile cleaner and water to remove any trace of cleaning product and then left to dry off overnight. We came back the next day and checked a few areas to make sure the floor was dry before sealing. 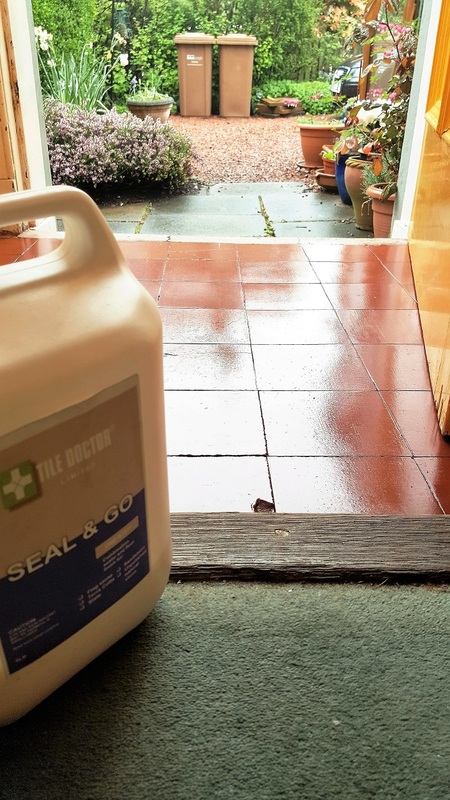 The tiles were dry so the sealing process was started using Tile Doctor Seal and Go which is an ideal sealer for Quarry tiles as it affords good stain protection whilst adding a nice subtle sheen to the floor, five coats were required before the tiles had become fully sealed. The porch tiles now look much fresher and with the new sealer should keep looking that way for some time in the future.